Flaxseeds and rye are healthy alternatives to several foods as they have certain ingredients that can benefit our health. Here is a simple recipe you can use to incorporate these ingredients in your cooking. 1. Heat a pan over medium flame. Add 1/3 cup of flax seed till it cooks for 4-5min (till it pops). Blend it till the seeds are finely ground. 2. In a large bowl, add 1 cup maida, rye flour and yeast and mix well. Add the warm water, oil, honey, and salt and beat it for 30 seconds. Stir in the ground flaxseeds and as much of the remaining all-purpose flour as you can and beat for 3 min using a wooden spoon. 3. Knead in enough of the remaining all-purpose flour to make moderately stiff dough. Place it covered in a greased bowl and keep aside for 45min. 4. Roll out into 16"X8" rectangle. Brush dough rectangle generously with water. Sprinkle with the 2 tablespoons of flaxseeds. Gently pat flaxseeds into dough. Cut dough crosswise into 1-inch-wide strips. Place strips 1 inch apart on prepared baking sheets. Place until nearly double in size (about 30 minutes). 5. Preheat oven to 425°F. 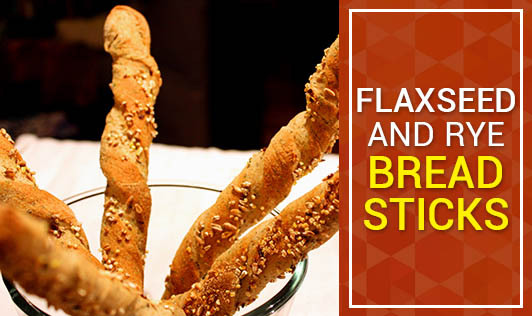 Bake breadsticks for 12 to 15 minutes or until golden brown. Remove from baking sheet. Cool and store in an air tight container.